How fortunate that this weeks challenge is reflections. Over the past few weeks I have been photographing reflections in preparation for a photography competition involving, you guessed it, reflections. The Clyde Arc (known locally as the Squinty Bridge), is a road bridge spanning the River Clyde in Glasgow, in west central Scotland, connecting Finnieston, near the Clyde Auditorium and SECC with Pacific Quay and Glasgow Science Centre in Govan. A prominent feature of the bridge is its innovative curved design and the way that it crosses the river at an angle. The Arc is the first city centre traffic crossing over the river built since the Kingston Bridge was opened to traffic in 1969. The crane’s primary purpose was the lifting of heavy machinery, mainly Springburn’s then renowned steam locomotives – onto ships for export. With the decline of locomotive manufacturing and other heavy engineering in the city during the 1960s, use of the crane continued to decline and it fell completely into disuse in the early 1990’s. The crane’s image is used extensively in the media, including by BBC Scotland news programmes and for the quintessentially Glaswegian crime drama Taggart. Moving on, but staying in Glasgow my next photograph is of the Clyde Auditorium. Beautifully lit at night, it can be seen reflected in the River Clyde, which on the night I was out photographing was reasonably still. The Clyde is tidal and on my side of the river you can see some movement but not enough to completely break up the reflection. 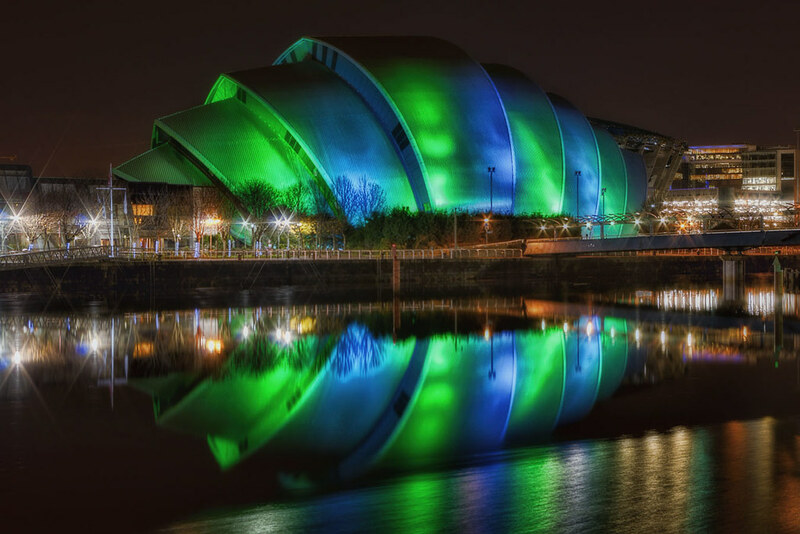 The Clyde Auditorium, familiarly known as “The Armadillo”, is a concert venue in Glasgow, Scotland. The building sits on the site of the now in-filled Queen’s Dock on the River Clyde, adjacent to the Scottish Exhibition and Conference Centre. I find night photography very relaxing, there’s less people about to walk in front of your lens, but the downside is you have to keep the shutter open longer to capture the photograph. A good tripod is required and in some cases you may have to wait 30 seconds from pressing the shutter button until you can move the camera again. From night to day now and from modern to ancient. Valle Crucis Abbey (Valley of the Cross) is a Cistercian abbey located in Llantysilio in Denbighshire, Wales. More formally the Abbey Church of the Blessed Virgin Mary, Valle Crucis it is known in Welsh both as Abaty Glyn Egwestl and Abaty Glyn y Groes. The abbey was built in 1201 by Madog ap Gruffydd Maelor, Prince of Powys Fadog. Valle Crucis was dissolved in 1537 during the Dissolution of the Monasteries, and subsequently fell into serious disrepair. The building is now a ruin, though large parts of the original structure still survive. Valle Crucis Abbey is now under the care of Cadw. Valle Crucis Abbey consisted of the church plus several adjoining out buildings which enclosed a square courtyard. The church itself ran West to East in the traditional cruciform style, today much of the original church is ruined, though the west end front wall survives, including the masonry of the rose window. The outbuildings including the adjoining east range, which survives mainly intact and the west range, which housed the lay brethren’s frater, but is now demolished. Completing the four sides of the inner courtyard was the southern frater and kitchen, which faced the church; these two building are also now ruins, with only foundation stones remaining. The east and west ranges housed the cloisters, with the east range also leading to the final structure, the abbot’s lodgings which settled between the range and the church but outside the courtyard. 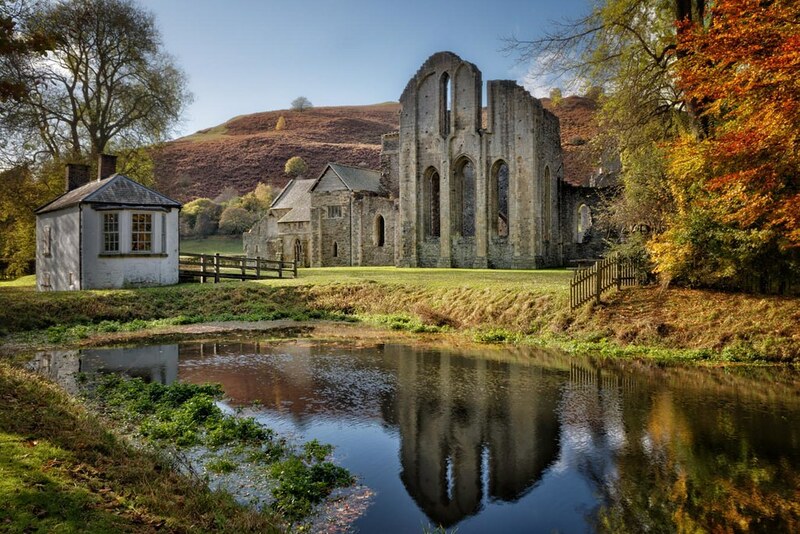 The site is also home to the only remaining monastic fishpond in Wales, but suffered from being remodelled as a reflecting pool in the 18th century. As well as the west end front wall, extensive parts of the east end of the structures survive to the present day. The chancel walls, the southern part of the transept, the east range of the cloister together with the chapter house and sacristy and the lower part of the reredorter (communal latrine) all survive mainly intact. In 1870 the west end wall was restored by George Gilbert Scott. Valle Crucis is just on the edge of the Snowdonia National Park and on Wednesday I was in the centre, looking for more reflections. 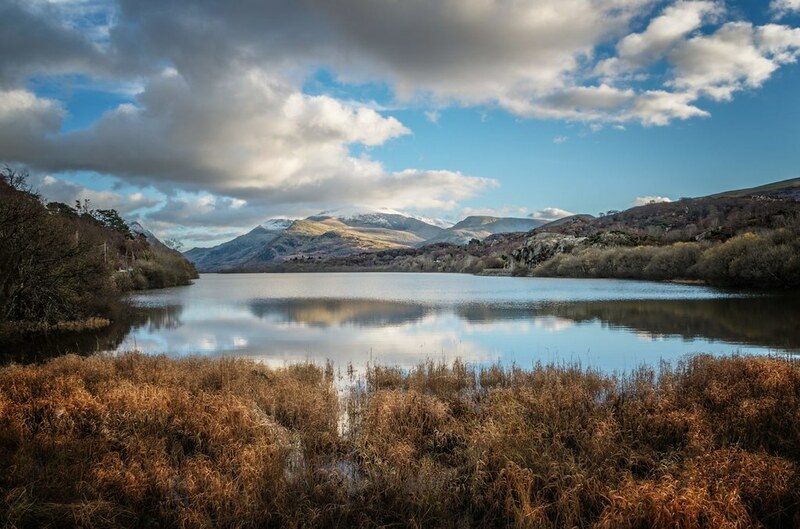 On the way home I detoured off the main road, as I often do, to find this great view right at the end of Llyn Padarn. It’s looking back towards Llanberis and Snowdon. Snowdon (Welsh: Yr Wyddfa,) is the highest mountain in Wales, at an altitude of 1,085 metres (3,560 ft) above sea level, and the highest point in the British Isles outside Scotland. It is located in Snowdonia National Park (Parc Cenedlaethol Eryri) in Gwynedd, and has been described as “probably the busiest mountain in Britain”. It is designated as a national nature reserve for its rare flora and fauna. Snowdon boasts some of the best views in Britain, and the summit can be reached by a number of well-known paths. The summit can also be reached on the Snowdon Mountain Railway, a rack and pinion railway opened in 1896 which carries passengers the 4.7 miles (7.6 km) from Llanberis to the summit station. The summit also houses a visitor centre called Hafod Eryri, built in 2006 to replace one built in the 1930’s. Well that about wraps it up for this week but before I go I’d like to show you one more photograph. Occasionally I like to get that big lens out (Sigma 150 – 500mm) and do a bit of bird photography. It’s far more challenging than photographing landscapes and sometimes very frustrating. Whereas I might take seven or eight photographs to get a really good landscape, it’s usually in the region of about 50 to 60 to get a good bird photograph, especially when they are moving. This photograph was taken at The Spinnies Bird Reserve in North Wales. 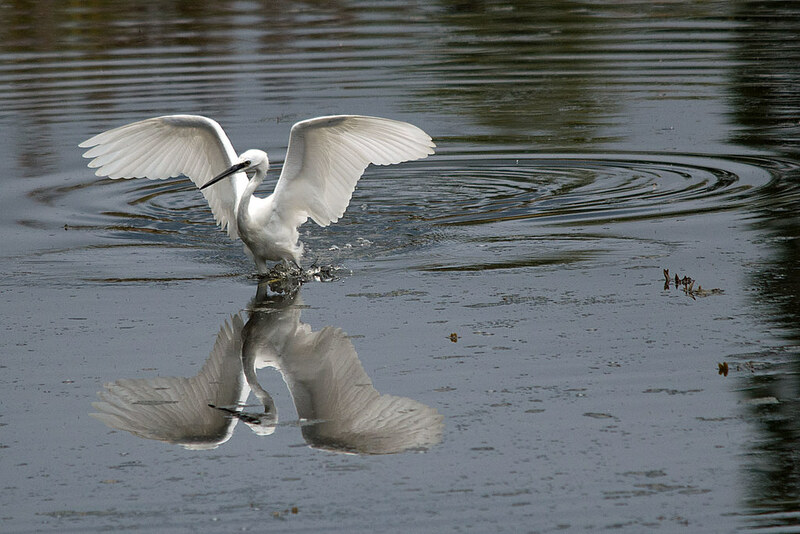 It’s a Little Egret running across the water prior to take-off. That definitely is it. No more photographs. I hope you enjoyed this selection of reflections and I would really appreciate it if you would drop me a comment saying which one you like. Who knows? You might just influence my decision on what photograph to submit to the competition. Next Post One Comment – In Other Words A Load Of Spam.. They are all spectacular. I truly, truly love the nature shots, but I think I’d go for the church. It is the one photo where I feel like I’m actually approaching the site myself on foot. It’s a great site to photograph especially in Autumn (Fall) when the tourists stop visiting. Round about mid October you can get in for free and I’ve spent two hours here and seen no one. What a luxury. I mean not only for contemplation purposes and for soaking in the mood and history of the place, but also for photographing. There isn’t that standing around for hours waiting for your potential shot to be clear of people. North Wales is steeped in History, We have lots of old castles, monasteries, farm buildings and slate quarries, all of which are deserted. At this time of the year it’s great to visit them, but for some of the more remote building you have to keep a good eye on the weather, especially on the higher hills. You are sure to be rewarded for these captivating images. Fabulous photos. I adore all the color! Thank you, You’ve just given me an idea for a Black and White photograph…. Beautiful collection, and I’m rather impressed at how beautiful Glasgow is at night. My favourite, though, is more nature based. Despite also being a big fan of photographing landscapes, I share your frustrations at getting great wildlife shots (read: getting any shots at all), and so, for me, it has to be your Egret running on water. It is a wonderful photograph. Some days when I go out to photograph nature I might fire off 7 or 8 hundred photographs. I’m lucky that my camera can take pictures really fast which is great for catpturing the action…but of those photographs I might only get 3 or 4 that I really like and would consider posting. Maybe I’m too much of a perfectionist…. Perhaps, but whatever works – is clearly working for you! Love the photos. They are such strong, clear reflections. Thank you. Reflections usually make for a good photograph there’s something about the symmetry…. stunning… very beautiful photos .. The Clyde arc photo is quite spectacular, but I also like the egret. How’s that for helpful? Well Terri in the end I went for the Amadillo, mainly because I like the colours…. I like the bird as the photograph is perfection! 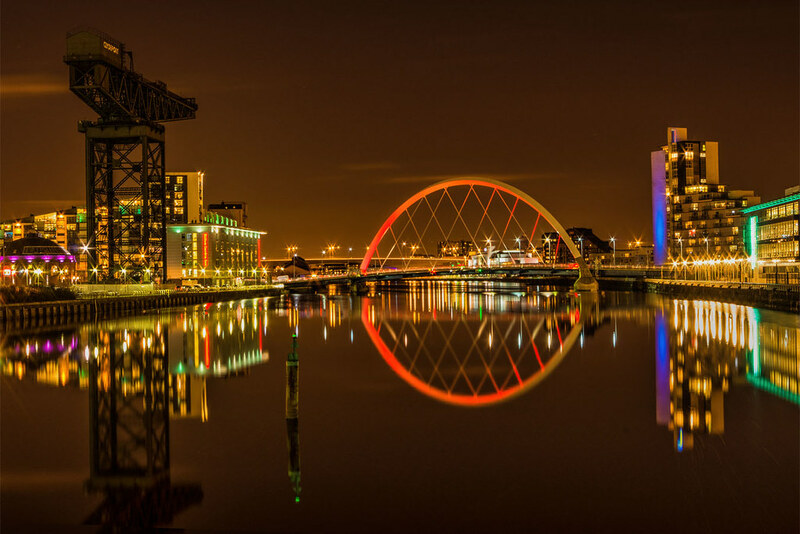 You have got amazing photographs , but my favorite one is The Clyde Arc , the reflection is so merging , it feels like there is this another parallel world upside down … Its mesmerizing …. Absolutely beautiful. The clarity in the first 2 is spectacular. I must say I love all the photos! In terms of being ‘eye-catching’ I think the photo of the Clyde Arc in Glasgow is a standout ….it’s positively heart-stopping………but I guess it depends on the parameters of the competition. Best of luck with it and thanks for some wonderful photos! Duuuuuuuuuuuuude Very awesome photos. My favorites are the Clyde Auditorium and the Snowdon one. Very nice shots. Thanks for including me and thanks for the visit. all magnificent, however, I am a sucker (as many commenters have already mentioned their personal preferences guiding their choice) for birds. I am a bird owner and lover, grew up in a family of bird watchers (I am not that patient). The egret is an especially beautiful creature, I find their stature elegant and regal. Pingback: “Weekly Photo Challenge: Reflections | Whose Shoes? Thanks for the pingback to my reflections post! I really like the luminosity and clarity of the reflections in your first two photos. The colors in your Valle Crucis Abbey give it a stunning sense of timelessness, with a touch of fantasy. I also love the elegance of your egret photo. Nice work on all of them!